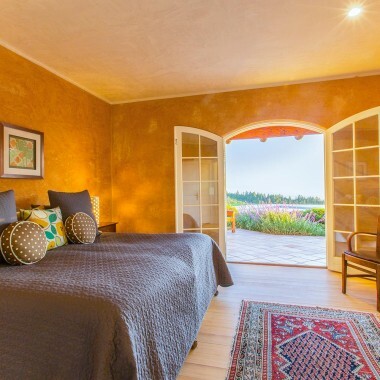 Welcome to the Wine Country Escape, a private luxury estate home located on a breathtaking hilltop in the heart of Sonoma County Wine Country. 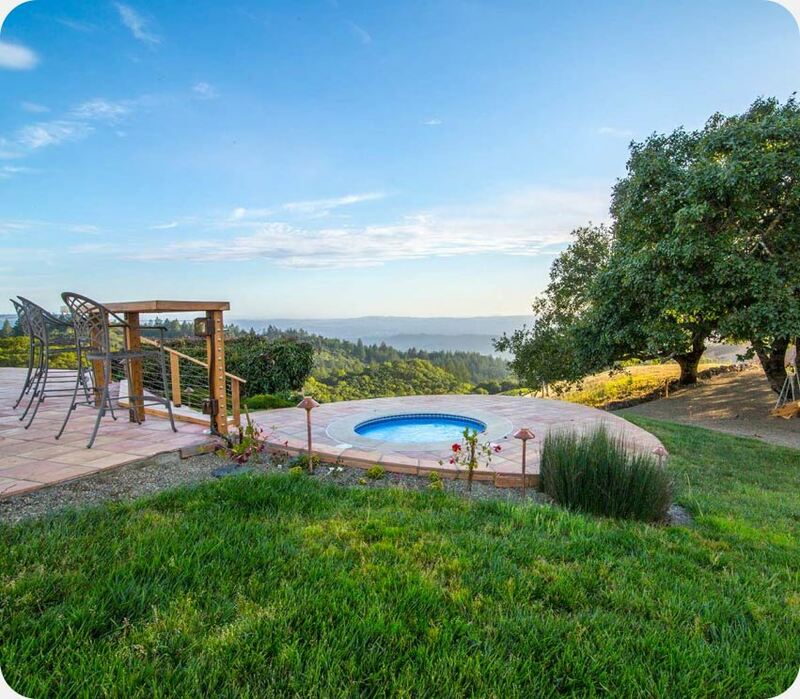 The Wine Country Escape is a is a stunning 7,400 square foot home located at 1,400 feet altitude, situated on a breathtaking hilltop in the heart of Sonoma County Wine Country. The three wing courtyard style home opens to beautiful terrace and pool. 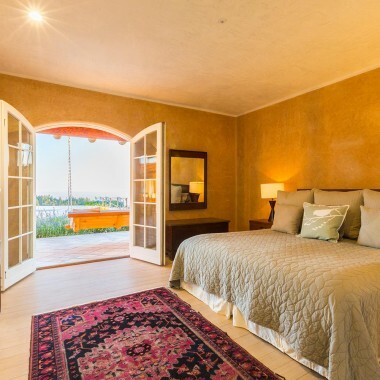 6 Bedrooms with king sized beds, private bathrooms, and private doors to the outside courtyard or orchard. 7th Bonus Room with two twin beds and a convertible sofa. 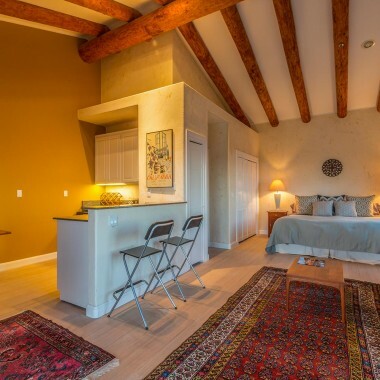 Sleeps 12-16. Fully appointed chefs kitchen equipped with 6 burner double range, oversized refrigerator, two full sized sinks, & two dishwashers. Stocked to prepare a gourmet meal, including dishes and cutlery for 24. Dining table seats 12. Mini bar with a sink, ice machine, wine and drink refrigerators. 86″ flat screen TV. Retractable doors open completely for fantastic indoor outdoor dining. The dining area joins a spacious newly remodeled gourmet kitchen. 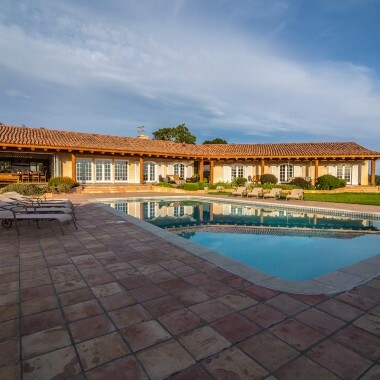 Large pool with incredible views of Sonoma County sits in the middle of the courtyard. Hot tub is set below the pool and seats 6-8. Pool is heated by solar in the warmer months. The pool is not heated in the winter. Brand new full size wet steam room and dry sauna room. Sauna comfortably seats 4-6 and steam 6-8. Giant radius rain shower inside steam room. The facility has a toilet and sink. This is an AMAZING space! Pool, hot tub, and several swings. Take a walk in our orchard. Large lawn area with baggo & ladderball games. Large Weber gas grill. Outdoor dining table comfortably seats 14-16. Propane fire pit and lounge area. Pristine 1950’s billiards table, a casino black jack table, and plenty of board games, puzzles, and cards. And if there are any musicians in your group, we have a baby grand piano! TV room has 72″ TV, with Apple TV, Netflix, and Direct TV service. Dining Room has 86” TV with Netflix and Direct TV service. 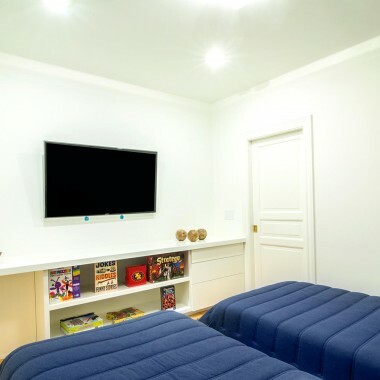 Bonus Room has 2 large TVs with Netflix, Direct TV service, and a WII U. For those traveling with children, we provide a crib, 2 pack and plays, 2 booster seats, a high chair, and an outdoor play structure. Almost every room in the house opens out to the pool. THE POOL IS NOT GATED, and there is NO LIFE GUARD on duty. Full sized laundry room with oversized washer and dryer. Laundry soap and fabric softener are provided. Iron and ironing board. Dry cleaning services are available upon request. 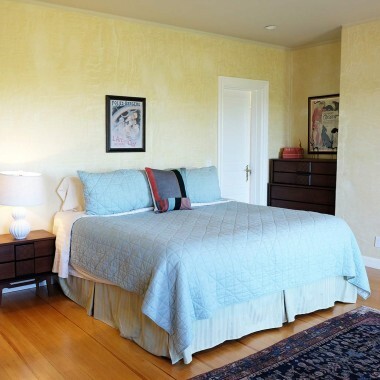 The entire home is heated by hydronic radiant floor heat, as well as radiators in each bedroom. There is no air conditioning. Fans provided in all bedrooms. The house stays fairly cool in the summer months. 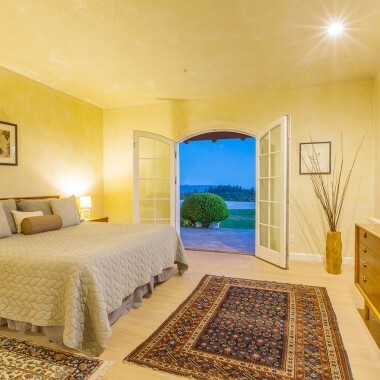 The Wine Country Escape is located on a breathtaking hilltop in the heart of Sonoma County Wine Country. 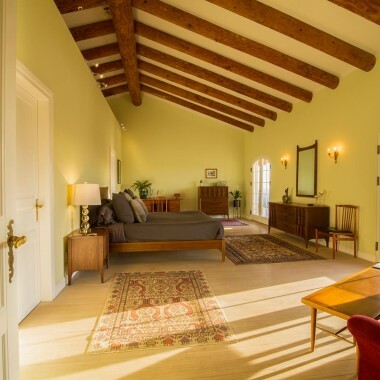 The Escape is a gated courtyard home located in an exclusive private gated community. You will need a car or driver to get around. You will be greeted you with a bottle of champagne and a cheese plate when you arrive, and given a full tour of the home to show you how everything works! I am available 24/7 for ANYTHING you need! Kenwood: 10-15 min, Sonoma: 30 min, Healdsburg: 30 min, Calistoga: 20 min, St. Helena: 35 min, Russian River: 30-40 min, San Francisco: 1 Hour 15 min.